The importance of the three documents, the general organization project, the service of the rear project, and the schedule of priority of shipments should be emphasized, because they formed the basic plan for providing an army in France together with its material for combat, construction, and supply. 12. Before developing plans for a line of communications it was necessary to decide upon the probable sector of the front for the eventual employment of a distinctive American force. Our mission was offensive and it was essential to make plans for striking the enemy where a definite military decision could be gained. While the Allied Armies had endeavored to maintain the offensive, the British, in order to guard the Channel ports, were committed to operations in flanders and the French to the portion of the front protecting Paris. Both lacked troops to operate elsewhere on a large scale. To the east the great fortified district of Verdun and around Metz menaced central France, protected the most exposed portion of the German line of communications, that between Metz and Sedan, and covered the Briey iron region, from which the enemy obtained the greater part of the iron required for munitions and material. The coal fields east of Metz were also covered by these same defenses. A deep advance east of Metz or the capture of the Briey region, by threatening the invasion of rich German territory in the Moselle Valley and the Saar Basin, thus curtailing her supply of coal or iron, would have a decisive effect in forcing a withdrawal of German troops from northern France. The military and economic situation of the enemy, therefore, indicated Lorraine as the field promising the most fruitful results for the employment of our armies. 13. The complexity of trench life had enormously increased the tonnage of supplies required by troops. Not only was it a question of providing food but enormous quantities of munitions and material were needed. Upon the railroads of France fell the burden of meeting the heavy demands of the three and one-half million Allied combatants then engaged. The British were crowding the Channel ports and the French were exploiting the manufacturing center of Paris, so that the railroads of northern France were already much overtaxed. 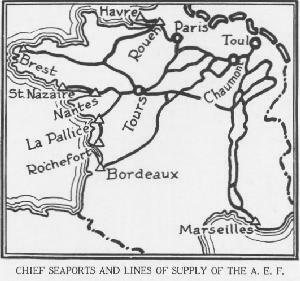 Even though the Channel ports might be used to a limited extent for shipments through England, the railroads leading eastward would have to cross British and French zones of operations, thus making the introduction of a line of communications based on ports and railways in that region quite impracticable. If the American Army was to have an independent and flexible system it could not use the lines behind the British-Belgian front nor those in rear of the French front covering Paris. The problem confronting the American Expeditionary Forces was then to superimpose its rail communications on those of France where there would be the least possible disturbance to the arteries of supply of the two great Allied armies already in the field. This would require the utmost use of those lines of the existing French railroad system that could bear an added burden. Double-track railroad lines, from the ports of the Loire and the Gironde Rivers unite at Bourges, running thence via Nevers, Dijon, and Neufchateau, with lines radiating therefrom toward the right wing of the Allied front. It was estimated that these with the collateral lines available, after considerable improvement, could handle an additional 50,000 tons per day, required for an army of 2,000,000 men. The lines selected, therefore, were those leading from the comparatively unused south-Atlantic ports of France to the northeast where it was believed the American Armies could be employed to the best advantage. 14. In the location of our main depots of supply, while it was important that they should be easily accessible, yet they must also be at a safe distance, as we were to meet an aggressive enemy capable of taking the offensive in any one of several directions. The area embracing Tours, Orleans, Montargis, Nevers, and Chateauroux was chosen, as it was centrally located with regard to all points on the arc of the western front. The ports of St. Nazaire, La Pallice, and Bassens were designated for permanent use, while Nantes, Bordeaux, and Pauillac were for emergency use. Several smaller ports, such as St. Malo, Sables-d'Olonne, and Bayonne, were available chiefly for the importation of coal from England. From time to time, certain trans-Atlantic ships were sent to Le Havre and Cherbourg. In anticipation of a large increase in the amount of tonnage that might be required later, arrangements were made during the German offensive of 1918 to utilize the ports of Marseilles and Toulon as well as other smaller ports on the Mediterranean. For all practical purposes the American Expeditionary Forces were based on the American Continent. Three thousand miles of ocean to cross with the growing submarine menace confronting us, the quantity of ship tonnage that would be available then unknown and a line of communications by land 400 miles long from French ports to our probable front presented difficulties that seemed almost insurmountable as compared with those of our Allies. 15. For purposes of local administration our line of communications in France was subdivided into districts or sections. The territory corresponding to and immediately surrounding the principal ports were, respectively called base sections, with an intermediate section embracing the region of the great storage depots and an advance section extending to the zone of operations, within which the billeting and training areas for our earlier divisions were located. 16. In providing for the storage and distribution of reserve supplies an allowance of 45 days in the base sections was planned, with 30 days in the intermediate section and 15 days in the advance section. After the safety of our sea transport was practically assured, this was reduced to a total of 45 days, distributed proportionately. When the Armistice was signed all projects for construction had been completed and supplies were on hand to meet the needs of 2,000,000 men, while further plans for necessary construction and for the supply of an additional 2,000,000 were well under way. 17. The organization of the General Staff and supply services was one of the first matters to engage my attention. Our situation in this regard was wholly unlike that of our Allies. The French Army was at home and in close touch with its civil government and war department agencies. While the British were organized on an overseas basis, they were within easy reach of their base of supplies in England. Their problems of supply and replacement were simple as compared with ours. Their training could be carried out at home with the experience of the front at hand, while our troops must be sent as ships were provided and their training resumed in France where discontinuedin the States.